A couple of years ago, I came across an amazing item on eBay. I don’t remember what I was actually searching for, but somehow I found a listing for a copy of a book that was printed only once, in 1943— the very first book written by famous children’s author Roald Dahl, known for writing such later works as Charlie And The Chocolate Factory and Matilda. I was utterly unfamiliar with this work, called The Gremlins, and to top it all off, Walt Disney’s name was also on the cover! My mind was blown. I have long considered myself to be a minor expert in Disney history, and I could not recall ever reading about such a thing. It appeared to be based on a Disney cartoon, yet I knew none had been produced (although the little horned creatures on the cover certainly looked oddly familiar). Where, then, did this thing come from?! I was dying to get a copy of this, but it was selling for big bucks. Fortunately, my curiosity would be satisfied this year with a reprinting of this unusual piece of Disneyana by comics publisher Dark Horse Books. As Leonard Maltin describes in his very helpful introduction, The Gremlins was an original story by Flight Lieutenant Roald Dahl of Britain’s Royal Air Force. Dahl had been stationed in Washington, D.C. as a military attaché at the British Embassy since a 1940 accident had left him unable to continue piloting fighter planes. The myth of gremlins was well known to British flyers— little, unseen creatures that caused all sorts of mechanical disruption to their planes. Dahl’s story, however, fleshed out the little fellows, telling a tale of their history and how they made themselves known to members of the RAF. Dahl needed to seek permission from his superiors before submitting stories for publication, and this particular story caught the eye of one Sidney Bernstein, a movie producer who served with the British Information Services in New York. Now, I don’t wish to plagiarize all of Mr. Maltin’s fine introduction (which has lots more wonderful details), so let it suffice to say that Mr. Bernstein enthusiastically sent Dahl’s story to his colleague in motion pictures, Walt Disney, figuring that Disney might find the story of potential interest for film development. As it so happened, Disney did indeed like the story, and he brought Dahl out to the studio in 1942 for a period of three weeks. They tried to hammer out details of plot and motivation, and when Dahl’s time was up he went back to Washington, D.C., never again to concern himself with what Disney would do with his story. Back in California, Disney and his team continued to debate how the story could be made into a feature. 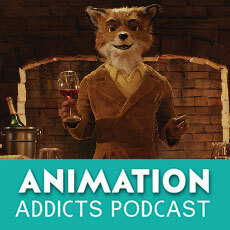 At times, it would be a mixture of live action and animation; at others, they considered doing it as fully animated. Regardless, Disney wished to bring this version of Gremlins to the public consciousness before anyone else could put forward a competing version. He went to Cosmopolitan magazine to arrange publication of a seven page “preview” of the “upcoming Disney film”, using Disney artists’ artwork and Dahl’s text. The preview appeared at the end of 1942, under the title Introducing The Gremlins. The full text of the story would appear in its own book in 1943, titled simply The Gremlins. In this instance, the story was credited to Dahl, with the book was copyrighted by the Disney studio. 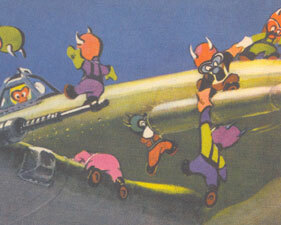 The artwork was uncredited, though Maltin makes it known that the illustrations were by animator and future director Bill Justice (black and white illos) and Al Dempster (full-color paintings). Maltin goes on to describe some of the Gremlins merchandise that also came out, as well as the comic pages in Walt Disney Comics And Stories. Unfortunately, progress on the film eventually petered out, and Dahl’s gremlins would fall into obscurity for decades. With the publication of the Dark Horse Books edition of The Gremlins in August 2006, we can now revisit this entertaining story and marvel at the whimsical artwork. Dark Horse publisher Mike Richardson is known for publishing books that he likes. He has good taste, too, having been the publisher of such comics-to-film successes as Hellboy and Sin City. I shall always also be grateful for Dark Horse’s handling of the complete Akira manga. 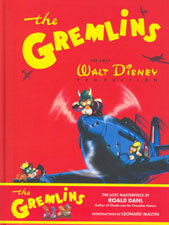 Richardson first became aware of Dahl’s Gremlins while watching the Walt Disney Treasures Disney On The Front Lines DVD set. He then set out to find out more about the book and ultimately secure the publishing rights. The story pages remain the same as in the original, though I am guessing that the typography was re-done for clarity. Told in 48 pages, the story involves a Royal Air Force pilot who bares perhaps a passing resemblance to Roald Dahl, especially considering what happens to him in the course of the story. Gus spots a gremlin on the wing of his Hurricane while flying over Dover. The mischief of the gremlin forces Gus to land his plane, and afterwards he relates his story to colleagues Jamface and Stuffy. Stuffy, the skeptic of the story, declares he has never heard of gremlins, and therefore doesn’t believe in them. That triggers the appearance of Gus’s gremlin, henceforth known as Gremlin Gus. Gremlin Gus introduces himself to the boys, and from then on the gremlins would work in the open. Soon, fifinellas appear, these being pretty female gremlins. Baby gremlins called widgets also appear in the story. We learn of where the Gremlins came from, and why they are so focused on sabotaging British planes. This gives the reader some sympathy for the little fellows, but on the other hand they remain dangerous. It is up to Gus and his colleagues to train the gremlins to be helpful towards the British and therefore the Allied war effort. This has mixed results, but in the end it is apparent that there is hope for the future. The book generally carries on with a straightforward story, with a couple of interludes (such as Stuffy’s story of high altitude gremlins called “spandules”) that seem out of place but are enjoyable in their own way. As for this being a “Dahl story”, his fans may note that this was just his first published work, and as such the characters are not as developed nor the humor quite as delicious as in later works. The entire book, though, brings to life a new mythology, one that is captivating and charming. It is easy to see what Disney saw in the story, and it is a shame that it could never be fully developed in animation. There are apparently many opinions as to why the film never happened—- copyright concerns, the difficulty of making the gremlins sympathetic, the appearance of Bob Clampett’s gremlins in the Warner Bros. cartoons… but in the end one should remember that many (if not most) optioned properties never do make it to the screen. Sometimes, it just isn’t meant to be. Maltin does tackle this subject as well in his introduction. It has been suggested elsewhere (but not in Maltin’s intro) that Clampett purposely was trying to agitate the Disneys. Maltin suggests, however, that Clampett was not the only one in town planning gremlin cartoons, and that Roy Disney politely asked other cartoon producers to put a stop to them while the Disney studio finished their version. The Warner Bros. cartoons, however, were well underway, and producer Leon Schlesinger instead had the names of the cartoons changed. Bugs Bunny And The Gremlins became Falling Hare, and Gremlins From The Kremlin became Russian Rhapsody. 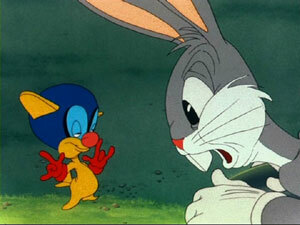 Both of these cartoons are great fun, featuring the typical Clampett wackiness. 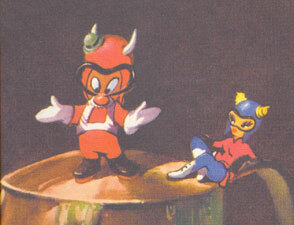 They also feature designs that do appear very similar to the Dahl/Disney versions, complete with goggles and horn-like wings coming from their heads. There is little doubt in my mind that Clampett’s gremlins were meant to be parodies of the Disney ones. Consider also that at the beginning of Falling Hare, Bugs Bunny is reading Victory Through Hare Power, a neat play on words evoking the book and Disney film Victory Through Air Power. Nevertheless, I doubt that the appearance of Clampett’s cartoons would have been enough to make Walt scuttle the film. Walt scuttled dozens of productions over the years, usually over story concerns. This is likely one of those cases. It would be many years until a Dahl story was made into a Disney Studios film, with James And The Giant Peach being released in 1996. With the appearance of this new edition of The Gremlins, Dark Horse is also planning other gremlins merchandise. PVC figures should be in comic shops now, and a three-issue miniseries has been announced. With the re-emergence of these fun characters, it is quite possible that Disney may be moved to find a new film project featuring the critters. In the meantime, I would heartily recommend the book, available now.